After years of jostling between American businessman Stan Kroenke and his Uzbek rival Alisher Usmanov, the deteriorating health of Danny Fiszman looks like it has broken the log jam in the control of Arsenal. The price paid by Kroenke of £11,750 per share, values the club’s equity at £731.05m. 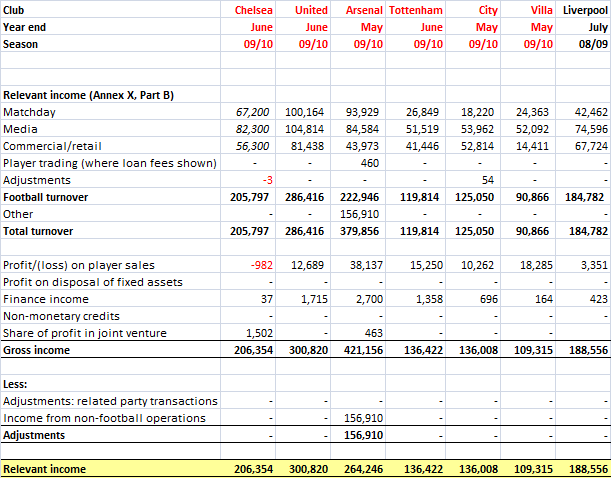 To read across from this valuation however we have to take into account the debt on the club’s balance sheet. 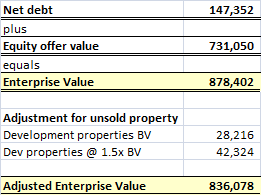 If we add this £147.4m net debt to the value of the equity offer we get the “Enterprise Value” (“EV”) of the business. So Kroenke is acquiring control of Arsenal at an Enterprise Value of c. £836m (adjusted for the remaining property) to £878m (unadjusted). This is a pretty hefty valuation on any measure. 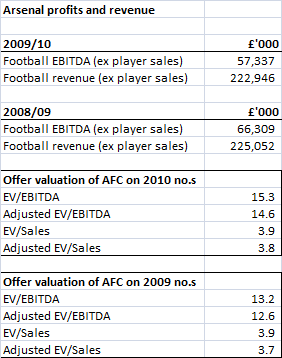 In 2009/10, the club generated EBITDA from its football business of £57.4m (excluding volatile profits on player sales). This implies historic adjusted EV/EBITDA multiple of 14.6x and a historic adjusted EV/Sales (football only) of 3.8x. In contrast to the Arsenal deal, Fenway Sports Group paid an EV of £300m for Liverpool last year, a historic EV/EBITDA multiple of 8.6x. At face value on that basis either FSG got a bargain or Kroenke is overpaying hugely. So what’s going on? I think the answer here is that FSG actually paid a higher multiple for Liverpool, and Kroenke is probably getting a slightly better deal than the headline numbers imply. The multiple of 8.6x is calculated using the £35m of EBITDA generated by Liverpool in the 2008/09 season. 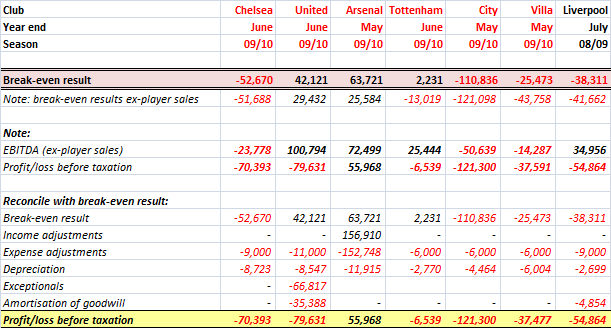 We do not have numbers for 2009/10 yet, but it was a poor year for the club. Having finished third in 2008/09, Liverpool only managed 6th in 2009/10 and exited the Champions League at the group stage. The failure to qualify for the Champions League in the current season will of course significantly impact profits in the current financial year too. It seems likely that it will take several years to bring Liverpool’s EBITDA back to the £35m level seen in 2008/09 and FSG’s £300m takeover should be compared to a depressed level of profitability, possibly as low as £25m which would take the multiple paid to around 12x. Arsenal is also “structurally” underperforming on its Commercial side due to the (at the time prudent) decision to sign a very long stadium naming rights and shirt sponsorship deal with Emirates in 2004. The shirt element which runs to 2012 is reportedly only worth £5.5m per annum compared to the c. £20m Aon and Standard Chartered pay United and Liverpool respectively and the c. £25m pa Barcelona are to receive from the Qatar Foundation. Arsenal “should” be able to earn a similar sum to its domestic rivals from the next deal creating a step change in profitability. Taking the expected bounce back in profits into account (and even ignoring a on better shirt deal in the future), the multiple Kroenke is paying for Arsenal looks closer to 13x than 15x EBITDA, more in line with FSG’s acquisition of a Liverpool missing out on the riches of the Champions League. Takeovers of Europe’s biggest clubs are very rare things, and it is therefore worth taking note when they happen. In the case of both Liverpool and Arsenal, American investors are taking a bet on the continued growth of English football which is in itself interesting. At Liverpool, John W Henry has spoken publically about UEFA’s Financial Fair Play being a key factor in buying the club and it seems reasonable to think that Stan Kroenke’s takeover show he is also a believer in the impact of the new rules. Wage inflation is a big problem even at Arsenal, where the salary bill has risen an average 7.5% per annum over the last four years. The move to the Emirates has made this affordable, but with that now complete, it is hard to see significant profit growth without the fall in player wage inflation that UEFA hope FFP will usher in. Turning to United, the other major club around which takeover speculation always swirls, today’s benchmark doesn’t really help the Glazers. The c. 13x “normal” EBITDA multiple Kroenke is paying would value United at c. £1.3bn. Unlike Arsenal the commercial side is already highly developed, meaning there is less “upside” to go for. Unlike Liverpool, there is no new stadium growth story to hang onto. If 13x EBITDA really is the “market valuation” for a major English club and with the Glazers reportedly looking for a £1.5bn+ price tag, it doesn’t look like much will happen soon. This is the first in a series of posts looking at the challenges faced by English clubs in complying with UEFA's Financial Fair Play ("FFP") rules. Next season (2011/12) is the first year when clubs' "break-even result" are calculated. The tables below shows what "break-even result" the seven English clubs that played in Europe this season would have achieved on last year's figures (Liverpool numbers are for 2008/09 as they have not yet published 2009/10 results). The "relevant income" calculation is the simplest bit of the FFP rules. All football club revenue (which I have divided into the common matchday/media/commercial and retail split) is of course included. In addition, the profit from selling players is included too. Profit in this sense means the difference between a player's selling price and the book value of his registration on the club's balance sheet. Players that come through a club's youth system have a zero book value and thus any sale proceeds are 100% "profit" in the FFP calculations. Income from non-football operations is excluded, except where they are based at or close to a club's ground (such as hotel or conference facilities). Chelsea's hotel would therefore be included in the income calculation, as would Manchester City's "Sportcity" redevelopment around Eastlands. Arsenal's property income from the re-development of Highbury would be excluded. The other major exclusion, and one no doubt likely to cause controversy, is revenue received from "related parties" (effectively the owner or people/corporations connected to them) in transactions that are carried out "above fair value". This rule (described in Annex X B 1j) says that transactions with a related party must be compared to the "fair value" that would have been achieved if the transaction was done as a normal commercial deal. Any income above this "fair value" is disregarded when calculating a club's income. This rule is designed to prevent owners subsidising their club by, for example, paying £50m per year for a box that would normally cost £250,000. The expenses element of the FFP is more complicated and less intuitive than the income side. Staff costs are included and are by far the largest element, indeed it can be argued that the whole aim of FFP is to bear down on staff costs across European football. Other cash operating expenses are included (the basic costs of running a football club), but depreciation of fixed assets is not included. This means that there is no account taken under the FFP calculation of any costs from investing in stadiums or training grounds. Owners can finance such capital expenditure without limit under FFP. Finance costs such as interest payments are included, but not if they relate to borrowing taken on to construct "tangible fixed assets" such as stadia, training facilities etc. In the table above, I have deducted the c. £14.5m of Arsenal's £20.8m of interest costs that relate to the club's financing of the Emirates. 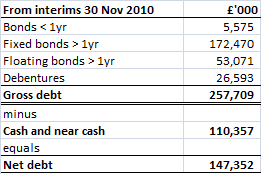 The interest figure for United excludes the significant one-off refinancing costs the club recognised in 2009/10. 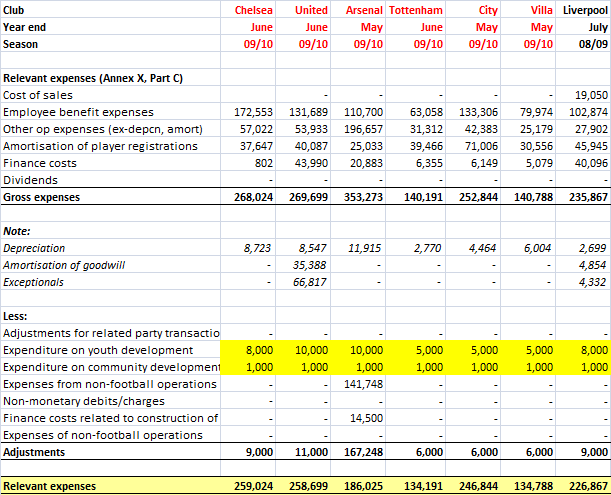 My understanding is that such costs would not be included under FFP. On an ongoing basis, United's bond interest will be around £44.5m per annum. A vital element of the expenses calculation is the inclusion of the "amortisation of player contracts" charge, which is how the cost of transfers is accounted for. The accounting treatment of transfer spending is one of the least intuitive elements of finance for most football supporters. In the UK, the treatment is covered by "Financial Reporting Standard 10: Goodwill and Intangible Assets". In a transfer, the asset that is being bought and sold is not of course the player himself but the player's registration. This "asset" has a finite length of course, being the length of the player's contract with the acquiring club and FRS 10 says that the cost of buying the registration must be "recognised" over that life. So when a club "buys" a player on a five year deal for (say) £20m, the cost is recognised over the 5 years at £4m per year, this is the "amortisation charge" for that player that appears in the profit and loss account. The timing of cash payments is irrelevant. The money could be paid up front or in agreed stages but the "cost" is recognised evenly over the contract. If after (say) three years the player negotiates a new five year deal, the remaining value (£8m in this example) plus any costs of negotiating the new contract (hello Paul Stretford et al) are added together and then recognised over the life of the new contract. By including the amortisation charge in the expenses calculation, FFP captures transfer spending over an extended period. Even if a club stops spending after a period of heavy investment, the amortisation charge will stay high for a prolonged period. 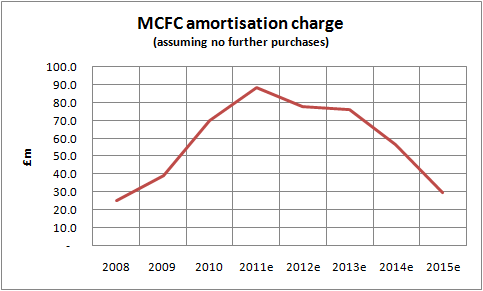 The chart below shows my estimate of Manchester City's charge over the next five years assuming no further purchases or sales (other than those players currently out on loan). Dividend payments are captured in the calculation (in order to ensure debt is not disguised as equity). If the Glazers exercise any of their dividend rights (currently around £95m), such payments would have to be included in the FFP calculation. As with the income calculation, transactions with "related parties" not done at "fair value" are adjusted for in the relevant expenses calculation. This is to prevent owners subsidising their clubs through taking on club costs (such as directly paying players for example). The final major adjustments in the expense calculation relate to spending on youth development and community activities. Both are excluded from the FFP numbers, meaning clubs can spend as much as they wish on these areas. I have estimated figures for all seven clubs as they are not separately disclosed in the accounts. Income minus expenses = "break-even result"
Subtracting "relevant expenses" from "relevant income" gives us the all important "break-even result". This is the key figure under the new regulations. In the first two "monitoring periods", seasons 2011/12 and 2012/13, clubs are not permitted to make a loss greater than €45m (c. £39.5m) over these two years combined if they are to receive a licence to play in Europe in 2013/14. As you can see from the table above, only three or the seven English clubs would have made a profit under the break-even calculation last year, and Spurs' profit was only due to profits on player sales. United would have shown a loss if the exceptional financing costs were included. The losses at both Chelsea and City stand out. The figures for Liverpool are misleading, because they include significant finance costs relating to the debt Hicks and Gillet loaded on the club which have now been cleared. Meeting the new rules is going to be hard for many clubs across Europe. A key question is the extent to which UEFA actually enforce their new rules. The credibility of Michel Platini and UEFA as an organisation are clearly on the line, and I believe they will be enforced, although that may well mean banning a major club from European competition. The rules do give one notable exemption to the calculations I have outlined for the first two seasons in which the rules apply (2013/14 and 2014/15), set out in Annex XI 2, the final page of the regulations. If a club breaches the "break-even" target in the "monitoring periods" for either of these seasons because of a loss in the 2011/12 season caused by wages paid to players under contracts signed before 1st June 2010 (when the FFP rules were published) the club will be let off (as long as losses are reducing over time). That is quite a big get out, and may well mean that City and Chelsea do not face the imminent prospect of a European ban. The exemption is only temporary however and the principle remains the same, if UEFA enforce FFP, many clubs are going to have to cut their wage bills and/or radically boost their revenues in the next few years.